Mandy Lane at 773-859-1305 or click below. Filled with real-world accounts of the journeys and successes of mission-driven initiatives, The Mission-Driven Venture clearly illustrates the transformative potential of social enterprise. 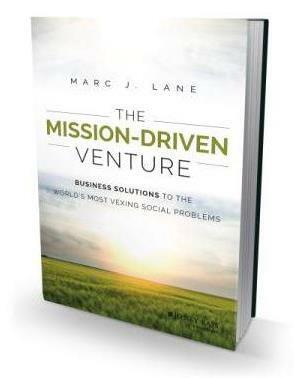 Throughout the book, Lane offers the information and tools needed for becoming an agent of change and shows how to move from idea to reality with a step-by-step guide to designing and implementing a successful mission-driven venture. Social entrepreneurs embrace mission-driven ventures that emphasize transparency and accountability. They lead by example. They fill a humanitarian vacuum left by government and charity, and they do so sustainably as only the private sector can. For example, social entrepreneurs may organize and operate a low-profit limited liability company that, by law, places mission above profits and facilitates foundation funding of charitable and educational businesses. The Benefit Corporation requires its managers to make decisions not only to enrich its shareholders, but also for the good of society as a whole. Social impact bonds provide long-term funds for promising social interventions, transfer risk to private capital markets, and tap into public coffers only when specific social benefits are achieved. Microfinance and microcredit are helping the poorest of the poor become self-sufficient business owners. And worker-owned co-operatives are converting the disenfranchised into self-reliant entrepreneurs. Impact investors, social entrepreneurs, socially conscious individuals, nonprofit and foundation leaders, and anyone committed to social innovation will find The Mission-Driven Venture to be a practical roadmap to the rapidly developing arena of social enterprise. 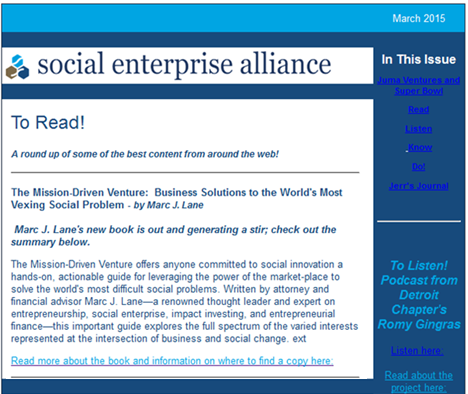 "Go ahead and sue me for saying it...but attorney Marc Lane has written perhaps the most thorough yet accessible volume I've yet seen on social enterprise. Here, you'll pick up both the finer legal points of the new hybrid business models and the inspiration of Dr. Yunus, and everything in between. Keep it at your fingertips!" "Marc does a masterful job of equipping the mission-driven entrepreneur with an understanding of various pathways for channeling enthusiastic passion towards actionable operation. I particularly appreciate his use of real-world examples to both inspire and make potentially intimidating concepts much more accessible." "The Mission-Driven Venture is one of the most comprehensive and understandable books on the fast-growing and rapidly-changing social enterprise sector. Whether you are an emerging social entrepreneur, a seasoned veteran, or just someone who wants to learn more about social enterprise, this book is well worth the read." "A wealth of information and practical advice for anyone considering starting a mission-driven venture, from one of the most knowledgeable experts in the field." Interview on "The Mission-Driven Venture"
© 2015 The NonProfit Times Publishing Group, Inc.